Thank you to Taos Footwear for providing me with a sample to review. This article may contain affiliate links. Summer’s almost here and It’s time to trade in those boots and winter wooleys for tank tops and sandals! I always look forward to Summer since warmer weather means new shoe shopping! I like to ring in the new season with throwing my boots in the closet and jetting it to my local shoe store to find something my toes can breath in. It’s always a bit of a challenge finding cute shoes that fit me. My feet grew about half a shoe size after having my two kids and God decided to so graciously bless me with wider than normal feet. So finding shoes that look good and look good ON me are two very big dilemmas I tend to run into. Luckily I stumbled upon Taos Footwear ! Taos Footwear offers a wide range of shoes, from sandals to casuals and are made from the finest leathers and materials. Grabbing inspiration from the south-western town of Taos, New Mexico, they’ve built their style around earth friendly colors, materials, embellishments and making the smallest environmental footprint they can. Taos Footwear brings a sense of comfort and style that is only measured through the reliability of their soles. They believe it’s a sin to make women have to choose between looking good and being comfortable and therefor have combined the two into one reliable brand of female friendly shoes. I was sent a pair of their gorgeous Siren Sandals to try out. I fell in love with them on the website but my love turned to devotion once I slipped them on my feet! First off though, my Taos arrived in an Eco-friendly shoe box made from recycled materials and featuring soy-based inks. My Taos were wrapped up nicely and after opening the box it seemed my feet were screaming to put them on! After basically ripping them out of the box I was super excited to see that the Siren Sandals featured an adjustable buckle on each side!! YAY! This means my wide feet won’t feel squashed and I can be comfortable! I did some adjusting and finally slipped them on. WOW! It was like my feet were getting a hug. The sandal’s microfiber insoles were so incredibly comfy and the high-end leather they are made of really shows through. The sandals also feature a rubber out-sole that makes sure I’m safe from slipping with every step. Taos Footwear shoes all feature a really neat Signature Contour Footbed that allows for proper support to be given where it’s really needed. This means no more flat-footed sandal issues, like what my flip-flops give me. There’s specially placed arch, metatarsal and toe support, so those long Summer days standing in theme parks on vacation will no longer be an issue! Another thing I loved about the sandals, was the color of the Siren’s. I received the Rose Gold, but they are also available in Black and Pewter. The little embellishments on the tops of the sandals hint at their south-western origins and I love that they go with everything. I’ve received loads of compliments on them since wearing them for the first time. They feel like I’m walking on a cloud that’s hugging my feet and I can really feel the difference with the Signature Contour Footbed compared to regular flat sandals. The Siren’s have quickly become my daily, go-to shoe and I’ve loved wearing them and showing them off! 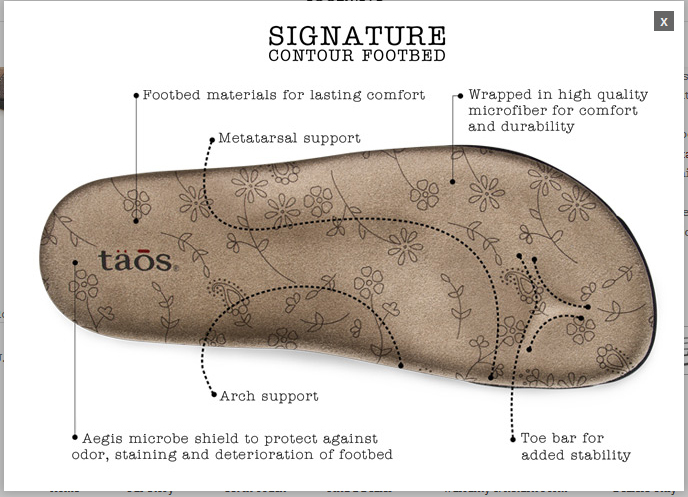 If you’re in need of a great new shoe this summer and are looking to show off your toes, I highly suggest letting Taos Footwear pamper your feet. If not for the great styles they offer then for the amazing support they provide your feet. Which ever style you choose is sure to be a head-turner! 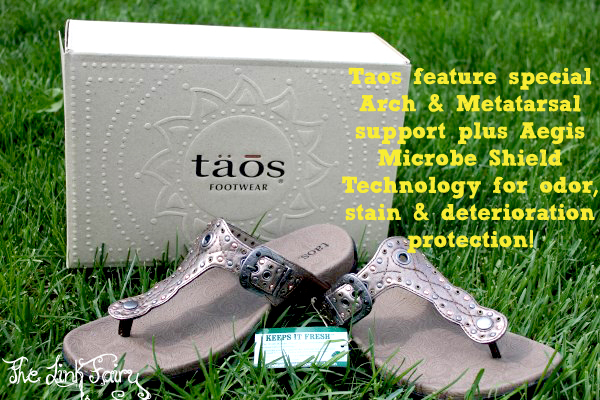 You can find the Taos Women’s Siren Thong Sandal featured in this review on Amazon.com between $82.50 – $110 depending on the size. See all the styles of shoes Taos Footwear offers on their website. Be sure to follow Tao’s Footwear on facebook and twitter to stay up to date on the latest products and promotions. I love shoes that offer a stylish take on support and that are eco-friendlier. I love the look of those shoes and will probably order some for myself! Thanks for the review and recommendation. Jennifer! So glad you found the review helpful! 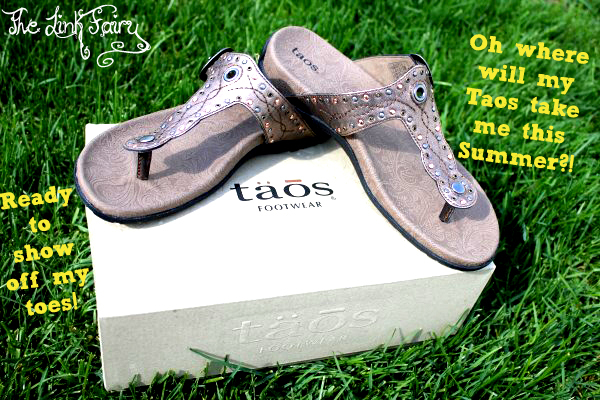 I absolutely LOVE my Taos sandals, and their other styles are just as fun looking. I’m sure you’ll find ones you’ll love. If you pick up a pair let me know which ones you chose! They are gorgeous! I LOVE them 🙂 I’ve gotten all kinds of compliments on them! Those are super cute and I would definitely appreciate the arch support.